What do we need all those black squares for? The answer makes more sense if we take a minute to define the precise nature of the difference. 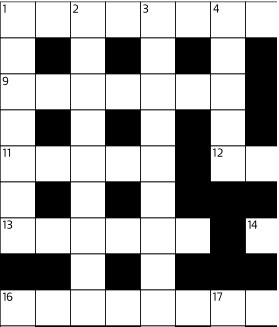 In a regular (or “vanilla”) crossword puzzle—the kind that you would encounter in the daily newspaper—one of the fundamental rules of construction is that every letter in the grid must appear in two separate words, one going across and one going down. (In crossword terminology, that letter is said to be “checked.”) In the Nation puzzle, and other cryptics like it, the requirements are just the opposite: every word should contain letters that appear in no other words. Why the discrepancy? It is rooted in the difference between cryptic and standard clueing. A standard crossword clue consists of a definition only, which is often not enough to guide the solver to an answer. If you saw the clue “US president” in a standard crossword, for instance, you would have no way to be sure of the intended answer. Even knowing that the answer is five letters would not be enough. You’d need to fill in some of the crossing letters—to find out, for example, whether the first letter was N (NIXON) or O (OBAMA)—before you could fill in the answer with confidence. But a cryptic clue has two parts, the definition and the wordplay, and they confirm one another. If the definition in a cryptic clue is “US president,” you don’t need to rely on crossing letters in the grid, because the wordplay will tell you whether the answer is NIXON or OBAMA or HAYES. In fact, we don’t want too many crossing letters, because that robs you of the pleasure of cracking each clue. 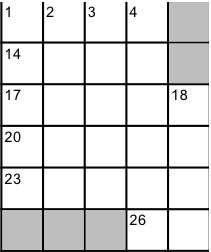 When you solve a standard crossword, some of the answers will appear by themselves as you fill in the crossing answers. But in a cryptic crossword, each clue is a little puzzle of its own, and ideally the solver should have the experience of tackling each one. Of course, it’s still important to make sure that filling in one answer gives solvers some help with the next clue. That’s why we stick to a fairly standard rule when making grids: In each entry, half the letters should be checked. In an entry with an odd number of letters, we round up, so that entry should begin and end with a checked letter. Do we always adhere faithfully to that rule? Almost, but not quite. Occasionally, a word with an odd number of letters will have unchecked letters sticking out on the front and back, which means that fewer than half of the letters are confirmed by crossing words. We did it in our audition puzzle because—well, because we didn’t notice (and were publicly lambasted for it by a friend who didn’t recognize us beneath our anagrammatic alias). We did it again in Puzzle 3210 because we were trying to get a high proportion of thematic entries into the grid, and that was the only way they would fit. Remember, it’s not really a flaw if you do it on purpose.